A disrupted Ukrainian parliamentary session suggests high risks for early parliamentary elections on October 26, the country’s Central Elections Commission (CEC) chief said in an official statement. Lawmakers were forced to abandon work on Tuesday due to disorder from radical nationalists near the parliament building. 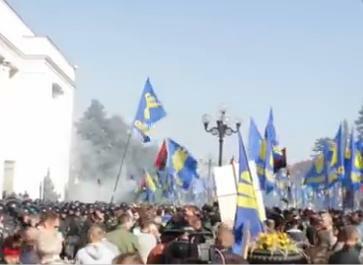 Svoboda party activists were protesting over parliament’s refusal to consider a bill declaring the nationalist Ukrainian Insurgent Army (UIA) WWII military organization fighting for Ukraine’s independence. Disorder grew into riots as radicals sought to storm the parliament building. Smoke candles, stun grenades and other charges were hurled at the police. Dispersing lawmaker numbers shrunk to below the required quorum level. Abandonment prevented debate over military action in the self-proclaimed Donetsk and Luhansk people’s republics and law on the parliamentary polls. Voting procedures for servicemen in those districts and repeat polls where voting was found invalid failed to make the session. “This situation jeopardises the election commission’s ensuring and protecting suffrage for Ukrainian citizens living or staying temporarily in Donetsk and Luhansk republics,” CEC head Mikhail Okhendovsky said. “This poses major risks for preparing and holding early polls under the country’s constitution, domestic laws and universally recognised international standards of free and fair elections,” he added, while Speaker Oleksandr Turchynov pledged to convene another extraordinary plenary meeting if called for.